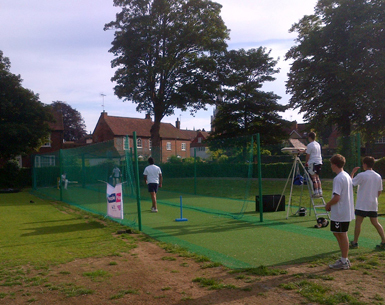 With its city centre ground flanked on two sides by the Roman city walls, when Chichester Priory CC was looking to replace its dilapidated cricket nets facility, aesthetics were an important consideration. The club elected to install a completely new facility comprising a state-of-the-art non turf playing surface fitted with a de-mountable netting system that would allow the system to be taken down relatively easily. Alongside the non-turf facility, a new 5 lane fine turf cricket nets practice area was needed complete with retractable netting / steelwork. With the project one of the few to be part funded by the Sport England’s ‘Inspired Facilities’ grant scheme in the past few years, alongside funds from the club itself and local Council, total-play was appointed to provide a playing surface based on the pedigree of its tp365 ECB Approved Pitch System NTP design and the team’s ability to provide a complete, managed solution for both non and fine / natural turf and elements of the groundworks; eliminating the need for multiple sub-contractors. 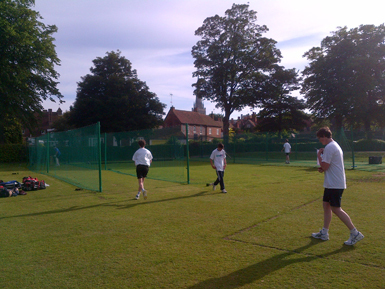 Work on site for the total-play team began with the removal of the club’s existing, non-turf cricket nets and security fence before returning the site back to natural turf. With the old facility removed, work on the site of the new facility commenced. Due to the site’s location in a busy public park in the centre of an ancient city, detailed method statements had to be produced to meet health & safety requirements and the team had to work very closely with the council throughout the project to avoid disruption to park users. However, it was not just the living residents that had to be accounted for in this project – during groundworks the disruption of Roman archaeology – including buried bodies – had to be carefully avoided.